12:45 Hello everyone and welcome back to AUTOSPORT Live for continuing coverage of the title-deciding final round of the Formula 1 world championship - the Abu Dhabi Grand Prix from Yas Island. The practice sessions have been completed and now it is time to qualify for tomorrow's 55-lap race. Pre-event predictions said it had to be, and in all three practice sessions so far the top four championship combatants have occupied the top four positions in the classification. Down in the pits, the tension is rising and something has to give this evening. A front row start is the obvious target for Vettel, Webber, Alonso and Hamilton but also factor into the mix that there is a big difference between the clean and dirty side of the track here, so third place in qualifying could eventually turn out to be slightly better than starting alongside the polesitter on the front row. This is just one of the fascinating factors that will play out as we go through the knockout session. 12:47 Red Bull Racing dominated an intriguing final hour of practice this afternoon in Abu Dhabi, as Sebastian Vettel set the pace on super-soft tyres with a lap of 1m40.696s to end the session 0.133 seconds ahead of team-mate Mark Webber. With the field keen to get to work today the drivers completed just one installation lap, but even then there were problems as Lewis Hamilton dramatically reported a vibration with a flatspotted tyre on his McLaren. A hasty and intense garage conference subsequently took place, as team boss Martin Whitmarsh first spoke to Button and then to Hamilton as they worked on a plan of action. 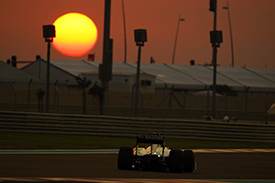 Hamilton was eventually able to place third in the session, but was more than half-a-second shy of Vettel's benchmark. Championship leader Fernando Alonso was fourth for Ferrari, but interestingly he went early on his super-soft tyre run as track conditions continued to improve lap-by-lap. Button wound up fifth and was less than one-tenth of a second down on the Spaniard and, if the British driver can get a good run in qualifying, he may just dent one of the championship contender's hopes. Petrov was a fine sixth for Renault, with Mercedes drivers Schumacher and Rosberg rounding out the top eight. 12:49 It remains fine and dry at the Yas Marina circuit with the sun starting to lower in the sky and some patches of cloud around. Sunset will be at 17:35 local time and the shootout will take place under the extremely bright and effective Musco lights. The radar picked up some showers to the west of Abu Dhabi city earlier, but they have since dispersed and we are set for a dry session. However, a strengthening wind may cause the drivers and race engineers some problems as a variable breeze gets up to around 20 km/h. 12:50 Keep up to speed with our minute-by-minute commentary on the move with the AUTOSPORT app. 12:53 Four drivers. One world title. This is crunch time. With grid position having a major influence on finishing order, the next hour could play a big role in determining the direction of the 2010 crown. Vettel topped this morning's session and looks a solid bet for his 10th pole of the season. However, team-mate Mark Webber knows that being ahead of the young German on the grid would give his title chances a major boost, so the Australian is sure to be fired up for the final shootout of the year. Hamilton dominated qualifying here last year and looks to have rekindled some of that form this weekend. The title outsider was particularly quick through the hotel complex after darkness fell last night and looks to have a good chance of upsetting Red Bull's charge to the front row. McLaren has also been setting the pace through the long straights of the middle sector, with its latest F-duct rear wing finally delivering the performance the team hoped for when it was first introduced back in Japan. Alonso hasn't displayed pole-winning potential so far this weekend, with the team admitting in the last hour that a second row place would be a good result. Nevertheless, the points leader remains the title favourite and keeping his rivals in sight on the grid is all-important this afternoon. 12:55 The battle for vital grid position at Yas Marina is now just five minutes away. 12:56 The track temperature has dipped to 33 Celsius as the sun continues to set rapidly overhead. 12:58 Sebastian Vettel walks towards his RB6, helmet on and looking for another one of those banzai pole position laps. The next hour will show us if he finds one. 12:59 Mark Webber climbs aboard his car and gets settled ahead of the start of the first period. 12:59 Ferrari chief Luca di Montezemolo is again on hand in the team's garage as the drivers get ready for a tense battle. 0 min: Qualifying is underway at Yas Marina. 0 min: Sebastien Buemi leads out Toro Rosso team-mate Jaime Alguersuari with several others following them out. 0 min: Heidfeld, Glock and di Grassi join the early runners. 1 min: Hulkenberg and Sutil exit the pitlane tunnel and join the racetrack. 1 min: Hamilton heads out on the harder tyre. Drivers have been finding quicker laps after several laps, rather than an explosive first tour. 1 min: Barrichello, Liuzzi, Klien and Senna also come out and we have 16 cars on the circuit. 2 min: Heidfeld is keen to get track position over Glock but the Virgin driver defends his line into Turn 11. 2 min: The Toro Rosso drivers cross the line and launch into the opening laps of qualifying. 2 min: Buemi is a tenth up on Alguersuari after the first sector point. 3 min: Alguersuari reverses the deficit at the end of sector two as they head towards the completion of the first timed lap. 3 min: Hamilton is now the fastest man through the first sector. 3 min: Alguersuari posts 1m43.428s to get the qualifying show on the road. 4 min: Buemi follows him across the line in second with 1m43.846s. 4 min: Glock and di Grassi join the order, just ahead of the first times from the Lotus pair. 4 min: Hulkenberg briefly takes over at the top with a lap of 1m43.221s. 4 min: Hamilton clocks a 1m41.245s to top the early order. 5 min: Button is also second quickest for McLaren as the Red Bulls wind up to their first efforts. 5 min: Alguersuari continues on for a second timed lap and improves up a position to third with 1m42.709s. 5 min: Alonso and Massa are also out for flying runs in the Ferraris, with only Kubica and Kobayashi still in the pits. 6 min: Webber and Vettel are on the circuit and working through their first effort now. 6 min: Heidfeld takes third quickest for now as the lap times continue to flood in. 6 min: Button reports a vibration to his McLaren team, which he says is "becoming massive". 7 min: Barrichello jumps up to second and Vettel crosses the line in third with a time of 1m41.886s. 7 min: Schumacher takes over third position with 1m41.679s and drops Vettel to fourth. 7 min: Massa appears on the timesheet with an initial effort for fifth quickest. 7 min: Webber is down in 10th after his first effort - 1m42.325s. 8 min: Hamilton improves the benchmark on his third flyer with a 1m40.743s. 8 min: Hulkenberg moves up to third in the Williams with a lap of 1m41.288s. 8 min: Alonso jumps into the fight with a 1m40.991s lap to go second quickest. 8 min: Button improves as his run continues, taking fourth quickest. 8 min: Vettel has slipped down to eighth and Webber is 13th currently as the drivers explore the limits. 9 min: Webber improves with a time of 1m41.556s to go eighth. 9 min: Hamilton leads the pack so far with Alonso second, Schumacher third, Massa fourth and Hulkenberg fifth. 10 min: Alonso doesn't improve on his second flyer after finding some traffic in the run around the marina. 10 min: Vettel is much quicker this time round and he posts the fastest first sector time. 10 min: Vettel catches traffic in the form of Christian Klien but still manages 1m40.617s to go quickest of all. 11 min: Webber also moves up and now sits in third with an improvement of 1m40.842s. 11 min: Kubica and Kobayashi are finally making an appearance as Hamilton sets the fastest first sector time. 11 min: Hamilton is the meat in the Red Bull sandwich, with Rosberg up to fourth and Alonso now fifth. 12 min: Schumacher returns to the pits in sixth position after two timed laps on that first run. 12 min: Alonso improves again with a 1m40.739s but it is Hamilton taking the top spot back again with a lap of 1m40.335s. 12 min: Vettel goes again and retakes the top spot with a lap of 1m40.318s. 12 min: Webber improves on his latest lap and is third after posting 1m40.690s. 13 min: The six drivers from the three new teams are in the dropzone. They were joined temporarily by Kobayashi but he moves into 17th with his first timed lap. 14 min: Alguersuari is now the man in the dreaded 18th position. He is one-tenth of a second down on Kobayashi's time. 14 min: Kubica is 13th after his late first attempt. 15 min: Buemi is in 16th with Liuzzi 15th, so it's a familiar group of names who will battle to escape elimination. 15 min: Alonso tops the order in 1m40.170s at the end of a lengthy run on hard rubber for the title leader. 15 min: Trulli is 19th and leading the new teams battle for Lotus, but his lap is almost two seconds down on Alguersuari's effort. 16 min: Kobayashi is on for a decent improvement this time round after posting two personal best sector times. 17 min: Kobayashi moves up to 13th and relative safety for the moment with a lap of 1m41.621s. 17 min: Alguersuari stays 18th with only a marginal improvement on his last attempt. He is three-tenths off 17th placed Buemi. 18 min: Button moves up from ninth to fifth as he begins another run on the harder tyre. 18 min: Petrov grabs eighth quickest in his Renault. 19 min: Button is the fastest man through the middle sector as he finds good pace on ever-warming tyres. 19 min: Alguersuari again fails to improve and stays in 18th place. 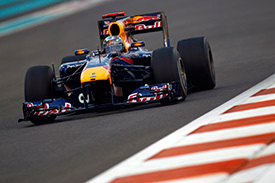 He will join the six drivers from the three new teams unless he can find three-tenths of a second on this lap. 13:20 Alguersuari posts a personal best 17.9s first sector but his team-mate counters with 17.7s. 13:20 Chequred flag is out on the first segment. 13:21 Alguersuari pulls out 1m41.707s to take over 17th place from his team-mate! 13:21 Buemi does not make it and is demoted by Alguersuari as the Toro Rosso drivers went head to head in the final stages. 13:22 Up front, Barrichello moved up to sixth with a late effort, while Rosberg springs up to second with a quick 1m40.231s. 13:23 Jaime Alguersuari beats toro Rosso team-mate Sebastien Buemi for the fifth time in a row in qualifying. 13:23 It is only the second time this season that Buemi has been eliminated at the end of Q1 - the other occasion being on the Sunday morning in Suzuka. 13:24 Jarno Trulli wins the new teams battle in qualifying for the eighth time this season as Lotus continues to lead Virgin and HRT. 13:25 The harder tyre has proven quick after several laps in Q1, giving the teams a headache on tyre choice for the second segment. 13:26 The remaining 17 drivers will now focus their minds on the next challenge. They have 15 minutes to post a time in the top 10. 13:26 Leading runners are likely to bank a time on hard rubber before a late run to see how the super-soft is performing prior to Q3. 0 min: Q2 is underway at dusk in Abu Dhbai. 0 min: Massa and Alonso are straight out in their Ferraris. 0 min: Schumacher and Rosberg join the Ferrari drivers on the circuit. 1 min: Hulkenberg follows out the Force India pair of Sutil and Liuzzi as Vettel studies the timing monitor. 1 min: Both McLarens are out for a run on the harder tyres. 2 min: Sutil crosses the line behind the Ferrari drivers and begins his first timed lap of the second qualifying period. 3 min: Alonso is setting the early pace as the first flying laps continue. 3 min: Vettel and Webber are now on the circuit for Red Bull. 3 min: Alonso sets a 1m40.475s early benchmark, with Massa second quickest for the moment. 4 min: Sutil is predictably slower than the Ferraris and goes third with 1m41.792s. 4 min: Liuzzi takes third position away from his team-mate with a time of 1m41.712s. 4 min: Button takes over at the top with a 1m40.267s while team-mate Hamilton is on a slow first tour. 5 min: Hulkenberg now takes over the musical chairs position in third with 1m41.572s. 5 min: Massa remains third after a slow final part of what was looking like a promising lap. 5 min: The order is Button at the front with Alonso second, Massa third, Hulkenberg fourth and Liuzzi fifth as we wait for the Red Bulls and Lewis Hamilton. 6 min: Hamilton is now the fastest man through the first sector but he's slow in the middle part of the lap. 6 min: Schumacher moves up to third position with a time of 1m40.738s as Mercedes continues to pose a threat to the top runners. 6 min: Button improves by another tenth to head the order in 1m40.156s, with Alonso now second quickest. 7 min: Barrichello is the next driver in third place with 1m40.548s but the Red Bull drivers are about to complete their first timed lap. 7 min: Vettel posts a sedate 1m43.541s time to go 12th, with team-mate Webber 13th at this stage. 7 min: Replays pick up Hamilton's problem - outbraking himself into Turn 8 at the end of the long straight. 8 min: But both drivers are now lighting up the timing monitor as they bid to move up the order. 8 min: Hamilton has pitted after failing to set a decent time on his first run, piling the pressure on the title outsider. 8 min: Vettel crosses the line in 1m39.874s to top the order and Webber moves into fourth with 1m40.450s. 9 min: Heidfeld and Kobayashi are now heading around for a first run. The pair have been eliminated during Q2 in the last three races. 10 min: The dropzone is slightly distorted currently with Heidfeld yet to complete his first timed lap. He will do so very shortly. 11 min: Both Ferrari drivers are heading out for a run on super-soft tyres. 11 min: Hulkenberg is 11th with Liuzzi 12th, Sutil 13th, Alguersuari 14th, Kobayashi 15th, Heidfeld 16th and Hamilton in 17th. 12 min: Hamilton and Button are also heading out on soft rubber to get a feel for the option tyre ahead of Q3. 12 min: Sutil moves up to 11th with a time of 1m41.475s and Heidfeld improves to 12th. 13 min: Hamilton and Massa have had a dispute over track position, with contact only narrowly avoided. 14 min: The stewards may want to look at that incident - Hamilton's second questionable moment in traffic this weekend. 14 min: Hamilton clocks a 1m40.119s to move up to second quickest on soft tyres. 15 min: That lap from Hamilton drops Kubica into 11th place with Sutil 12th and Heidfeld 13th. Rosberg is on the bubble in 10th. 13:42 The flag is out on Q2. 13:42 Sutil posts an improvement but remains in 12th - he is eliminated. 13:42 Button pips his team-mate for second quickest qith a 1m40.014s, with Webber further splitting the McLarens as he grabs third. 13:43 Kobayashi improves to 12th with a lap of 1m40.783s but he too is eliminated. 13:43 Kubica is also out and was not able to improve so he ends up in 11th. 13:44 Rosberg springs up to third quickest with another late effort - 1m40.060s. 13:45 Replays show that Kubica had a very scrappy end to his final qualifying attempt. He ran wide at the penultimate corner and was then too eager on the power at the exit of the last corner onto the pit straight. 13:46 Kubica does not make it into Q3 after a great 22-race run of taking part in the shootout. 13:46 Petrov made it through in 10th and out-qualifies his team-mate for only the second time this year. 13:47 Kobayashi qualifies 12th for the third event in a row. Last weekend in Brazil he scored points - also for the third time on the spin. 13:48 Up front, Vettel held the advantage from the late rush of soft-tyre runs by Button, Rosberg, Webber, Hamilton, Alonso and Massa. 13:49 Workers are now replacing the bollard that was taken out by Hamilton's McLaren as he vaulted the kerb to avoid Massa's Ferrari. 0 min: The final pole battle of 2010 is underway. 0 min: Rubens Barrichello is the first man out onto the track in the shootout. 0 min: The McLaren and Ferrari drivers head out for an early run. 1 min: Schumacher, Rosberg, Vettel and Webber are content to wait out the first minute. 1 min: Webber exits the Red Bull garage to join the Ferrari and McLaren drivers on the circuit. 2 min: We could be seeing a split strategy here from Red Bull. Vettel still hasn't left the garage with just over seven minutes remaining. 2 min: The first flying laps begin under the lights with a tense atmosphere surrounding a potentially very close battle for the front few rows. 3 min: Hamilton is the fastest man through the first sector on the initial lap. 3 min: Barrichello gets the board running with a lap of 1m41.092s. 4 min: Button clocks a 1m39.823 but Hamilton is faster and tops the times so far in 1m39.582s. 4 min: Webber is on a hot lap now and Vettel only exited the pits with 6m32s remaining - definitely one run for the German. 4 min: Alonso can't beat the McLarens, and nor can Massa, with the pair slotting in third and fourth quickest. 5 min: Can Red Bull respond to this turn of pace from McLaren? Hamilton's 1m39.582s is the fastest ever around this track. 5 min: Webber is now in the final sector. He crosses the line in a slow 1m48.117s as he beds in his soft tyres. 5 min: The Ferrari and McLaren drivers are already back in the pits for tyres and fuel. 6 min: Vettel launches into a qualifying attempt and is less than a tenth off the target time at the first sector. 6 min: Vettel is now +0.137s off the target after two sectors while Webber has made an error on his second timed lap. 7 min: Vettel crosses the line and moves up to top the order and provisional pole with a lap of 1m39.448s. 7 min: While the others pit for a second set of tyres, Vettel can hammer on and he's flying on his second lap. 7 min: Hamilton leaves the garage on fresh tyres to try and fight back on Vettel's new benchmark. 8 min: Hamilton is currently second with Button third, Webber fourth, Alonso fifth and Massa sixth. 8 min: Button, Alonso and Massa are also all heading around for a late single-lap attempt. 8 min: But it's Vettel who is absolutely flying in the Red Bull. Webber goes fourth with 1m39.925s and has one attempt left. 9 min: Vettel crosses the line in 1m39.394s and now has a gap of two-tenths of a second and he;'s going for it again on a third timed lap. 9 min: There is heavy traffic as the pack tries to find space in the final sector. 9 min: Webber is two-tenths off Vettel's first sector time on his latest lap. 14:00 The flag is out - can anyone topple Vettel now? 14:00 Chaos with the traffic but here comes Webber ... and it's not good enough. He remains fourth and is now a target for the others. 14:00 Things got very messy in the final corners as they all looked for track position. 14:01 Hamilton is slower than Vettel's best through the first sector. 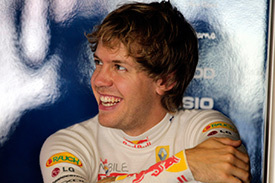 14:01 Vettel did not improve on his final effort and the time to beat for the others is 1m39.394s. 14:01 Hamilton misses out by a fraction and is second on the grid. 14:02 Alonso grabs a vital third, demoting Webber down to fifth. 14:02 The others cannot beat the time and Vettel claims pole position for the Abu Dhabi Grand Prix! 14:02 Button ends up fourth for McLaren. 14:04 Sebastian Vettel claims the 15th pole of his career with Hamilton securing a front row start. 14:05 Alonso winds up third with Button proving to be the fly in the ointment in fourth ahead of Webber in fifth. 14:06 Massa was sixth and followed home by fellow-Brazilian Barrichello. Schumacher is eighth with Rosberg ninth and Petrov rounds out the top 10. 14:07 It is a great result for Ferrari and Alonso will secure the title if the race finishes in grid order. 14:08 Fifth is a disaster for Webber. The Australian has his three championship rivals and Jenson Button ahead of him on the grid. 14:10 Webber will at least start on the clean side of the circuit, so will have a small opportunity to dispatch Button before Turn 1 tomorrow. 14:10 But Red Bull takes a remarkable 15th pole of the year, matching the record also achieved in dominant seasons by McLaren and Williams. 14:11 The Red Bull pair are also the only drivers to have made Q3 in every race of the season, underlining the raw speed of the RB6. 14:16 A fantastic qualifying session ends with a bittersweet symphony for Red Bull Racing, with Sebastian Vettel on pole and Mark Webber only fifth on the grid. Lewis Hamilton pulled out a great performance to secure a start on the front row of the grid and Alonso may be hoping that the Briton doesn't get any penalty for his brush with Massa later this evening, because that would move him to the dirty side of the circuit for the start. Jenson Button has a job to do for Hamilton this weekend and the out-going world champion has started that task very well with fourth on the grid. There are many permutations and fans everywhere will certainly be mulling over the possibilities over the next 23 hours. Who will be the 2010 world champion? Join us from 11:30 GMT tomorrow for all the answers.